The need for training in business today expands far beyond onboarding and developing internal employees. As businesses grow, they begin to expand their reach through partners, distributors and resellers. This business model is known as an extended enterprise. It can be a challenge for a business to quickly and accurately communicate value to all of its dispersed stakeholders – including employees and customers. To optimize performance in a complex business environment, it’s important to have a strategic training plan and learning management system (LMS) in place. #1: Your industry is competitive and customer defection is a major concern. No matter your industry, standing out among the competition is always a challenge. To attract and retain the best customers, it’s necessary to provide the best customer experience. Research has shown that customers are more likely to find value in a product that they can easily understand. Add real value to your customer experience by creating easy-to-follow training that customers can complete online at their own pace. Once your customers experience the benefits of your products, they are much less likely to defect to a competitor. #2: Your brand isn’t generating enough awareness with your channel and customers. Most likely, you’re not your partners’ only partner. And you’re not your customers’ only vendor. How do you stay top of mind for your partners and customers when they’re inundated with information every day? Developing branded training materials that your channel and customers can access through a learning portal that also reflects your brand is an effective strategy. Drive your partners and customers back to your LMS often with new training to keep your brand top of mind. #3: Training your channel and customers is too costly. Training your extended enterprise does take an investment of time and resources. However, delivering online training with an LMS saves significant costs associated with traditional, in-person training (travel, venue and trainer fees, etc.). Creating an online extended enterprise training program allows you to cost-effectively scale your training efforts and reach more people for less. #4: External sales channel performance isn’t meeting expectations. A knowledgeable salesforce is your best weapon against the competition. Your sales partners should have an in depth understanding of how your products and services benefit customers and why you’re better than the competition. By delivering training to your extended salesforce with an LMS, they will have the critical knowledge they need to sell your products and close more deals. #5: Support for your products/services is lacking. If your partners have difficulty supporting your products, they will either provide a poor customer experience or stop supporting your products all together – which are not the ideal outcomes your business needs. #6: Selling courses requires a complicated process involving multiple systems. Many businesses have discovered the benefits of generating additional revenue by selling their training. However, many are prevented from getting started with eCommerce because it seems difficult to implement and provide ongoing support. An eCommerce-enabled LMS (like the eSSential LMS) offers not only the robust eCommerce functionality needed to support selling courses to businesses or consumers, but the reporting, automated reminders, deadlines, and everything else you need to manage training. Over half of our clients train their extended enterprise with eSSential. In 2017, Talented Learning named the eSSential LMS the #1 best Extended Enterprise LMS. 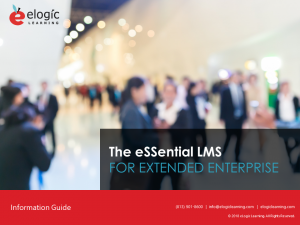 Download our datasheet, “The eSSential LMS for Extended Enterprise” to learn how we can help you create a winning extended enterprise training program.